Product #21039 | SKU 021407 | 0.0 (no ratings yet) Thanks for your rating! 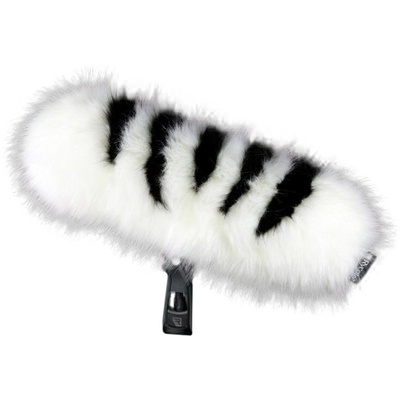 The zebra patterned Animal Windjammer from Rycote is a synthetic animal fur cover designed to fit over a #4 windshield. It offers up to 50 dB of wind-noise attenuation when used to capture audio recordings in extreme outdoor conditions such as on boats, beaches, or in stormy weather and more. It features a drawstring and toggle to allow a snug fit over the windshield. A fold-flat hairbrush is included to maintain the effectiveness of the synthetic fur pile.